What would you think if you learned that your great-grandmother had been committed to a sanitarium? When I first heard this, I thought that either she had been insane or had contracted tuberculosis. Well, I was wrong on both accounts. This article will explain my Great-grandmother Annie Norris Gray’s (1850-1922) time and situation at the Mercer, Pennsylvania, Sanitarium, using what few clues we have from four postcards she sent to her daughter Edna “Janet” Jeannette Kellar (1887-1980) in the spring of 1911. There were probably more exchanges, but as far as I know they are not part of family’s collection. 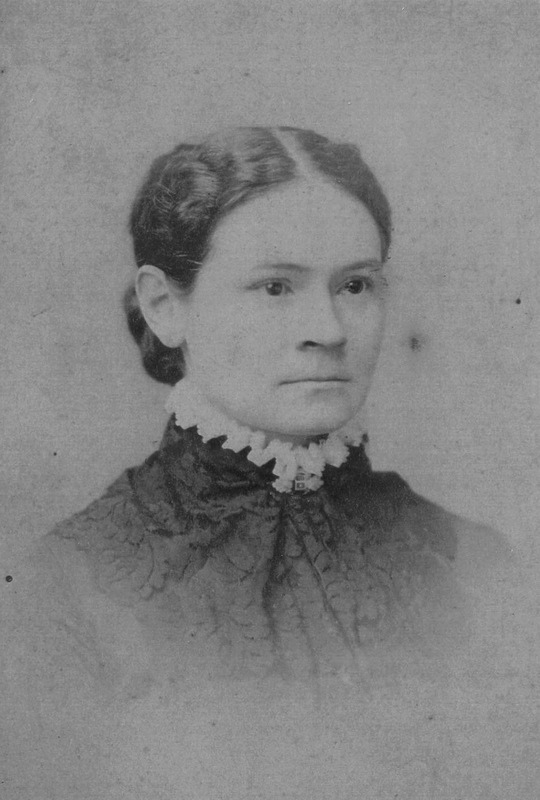 Annie was the wife of Robert Patterson Gray (1844-1928), who had been the recipient of several letters, 1901, 1906, and 1908, that we transcribed and commented on recently. The postcards certainly provide additional context to that era and life on the Gray farm in West Deer Township, Allegheny County, PA. All of these communiques are part of a collection of Gray artifacts with summary made available recently by my cousins Janet Hull and Dr. David Gray, Annie’s grandchildren. The first impressions of the postcards includes their 1-cents stamp, Mercer, PA, postmark of the same day they were written, and the name and address of the recipient, Miss E. Janet Gray, simply Gibsonia, PA. Annie has written “R.F.D.” at the bottom of the space, reminding the post office that this is Rural Free Delivery, something that is no longer relevant in this age of telephone 911-specific street addresses. These, then, are some things to look for. Because of the number of cards, I will insert them here. Because of the similarity of content, I will keep them together then return with additional comments. [A picture of the Sanitarium with captions covers most of the back] This place is as beautiful as the picture. My room has an east-end south window. The people hear [sic] are very kind. It does not take long to get acquainted. The ladies carry me water from the mineral spring. I like the water hear [sic]. Write me a card every evening, Janet. Janet – My health is lessoning. My joints are sore. I nead [sic] walking. I have to go slow. I take a baby [?] treatment at three. They do me good. We had [?] a heavy rain yesterday. I hope it was rain for everyone. One of the patients left hear[sic] on Saturday. Died Wednesday. Heart failure. He was about 80. I did not hear from Aunt Mary yesterday. Would like to know how she is anyway. It will be hard for Mother to get through of pneumonia at her age. I hope she will get better but I might get the word to go to see her if she ask[s] for me. Want to stay here some time. Janet – Hope you are all well. I am as usual. I am looking better than when I came. I have had treatment every day this week. I will have a bath today. I like Mr. Noll to give me treatments. He uses the electricity every time. It takes more to do me for I have so little in my body. I would hardly notice what would make him jump. I have a good appetite – enough for me. I am not weakening at the exercise. Let’s pick up again by defining the concept of “sanitarium.” To my relief, Wikipedia defines it simply as a medical facility for long-term or chronic illness. In some places, a sanitarium might even be considered a health-oriented spa. Nothing in the postcards as much as hints that Great-grandma was insane or had a life-threatening illness. Instead, knowing from my mother, Ruth Pearce (1917-2005), that both of her grandparents had severe arthritis, I believe Annie suffered so badly that she could barely use her arms and could not walk. Mother said that she remembers her grandmother having to be carried from bed to the table to eat when she wasn’t being fed in her room. 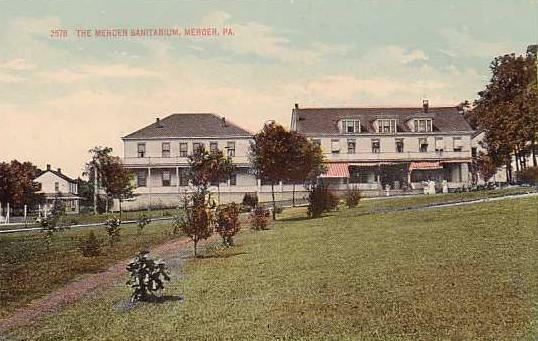 Googling “Mercer Sanitarium” provides an excellent history of the institution, which was built in 1900 on the grounds of an older health center constructed in 1850, known as the Mercer Water Cure. Additional land had been acquired from the Mercer Soldiers’ Orphans School. The mission statement of the Sanitarium indicates that it was established for “Chronic invalids, many of whom suffered from nervous disorders.” Dr. Mary McKinstry-Hull (no relation to our Janet that we know of), the director was always quick to point out that she did not treat mental diseases. There is nothing in the postcards to suggest anything but normal cognitive function for Annie. In fact, she sounds hopeful, even cheerful most of the time. Furthermore, she mentions several persons who are apparently older than she with more serious health conditions. Some back then might have considered her elderly at 61, but by today’s standard, she hadn’t even reached retirement age. The Sanitarium ground must have been beautiful with groves of trees and adjacent fields. By 1913, the institution owned 52 acres complete with a stream, a barn, ice house, chicken coops, gardens, and a herd of eight Jersey cows. Most of their food was supplied by the acreage. The large main building had electricity and was heated by steam generated by natural gas. It’s said that the soft spring water was pumped to two tanks on the hill above and gravity-fed the rooms. Yet another spring was referred to as “chalybeate,” or providing mineral water with health-giving properties. We don’t know exactly what Annie’s “treatments” consisted of, but she says in Card #1, “The ladies carry me water from the mineral spring. I like the water here.” She also refers to getting a bath in Card #3. It will be hard for Mother to get through of pneumonia at her age. I hope she will get better but I might get the word to go see her if she asks for me. Fortunately, Mother Elizabeth lived another five years. 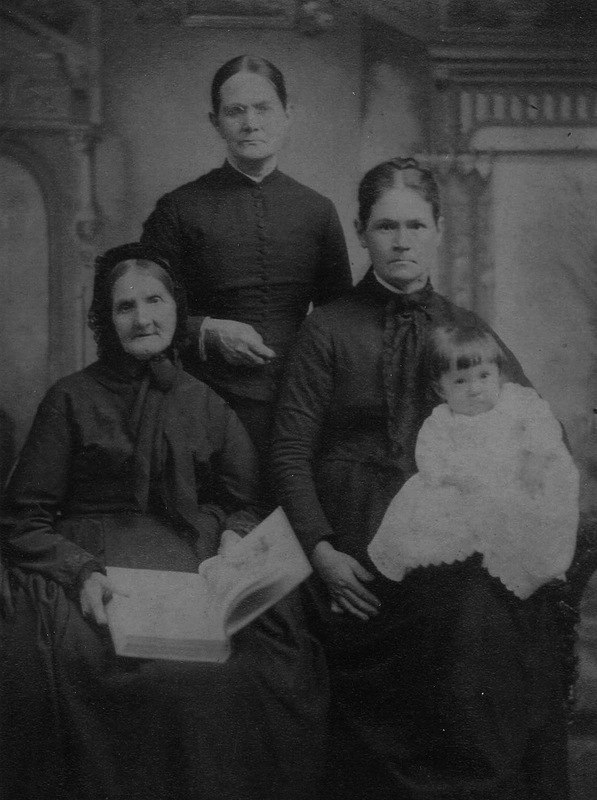 Aunt Mary was Annie’s sister, Mary Pillow Norris Bryce (1852-1940). We don’t know exactly where these women lived after the early deaths of their husbands, but we might assume they lived on the Gray homestead. 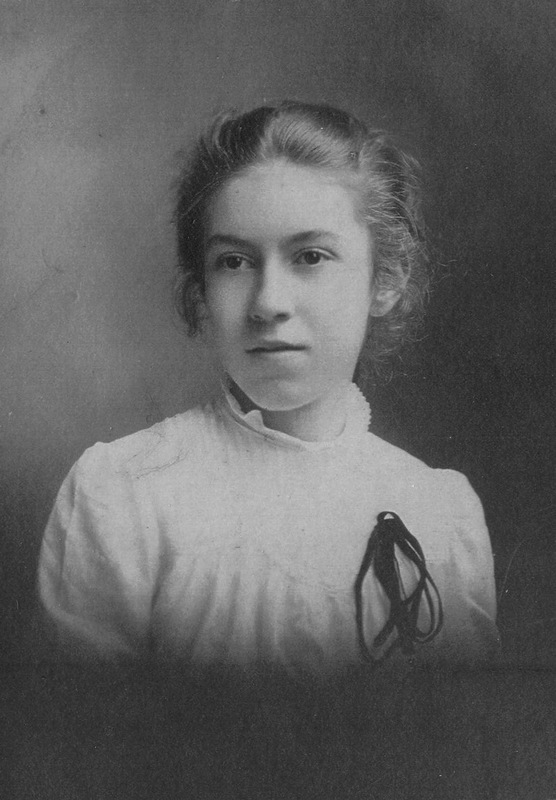 Aunt Mary was an accomplished artist and musician who married an heir to the Bryce Glass Company of Pittsburgh. I proudly display one of her paintings on the wall of my office. 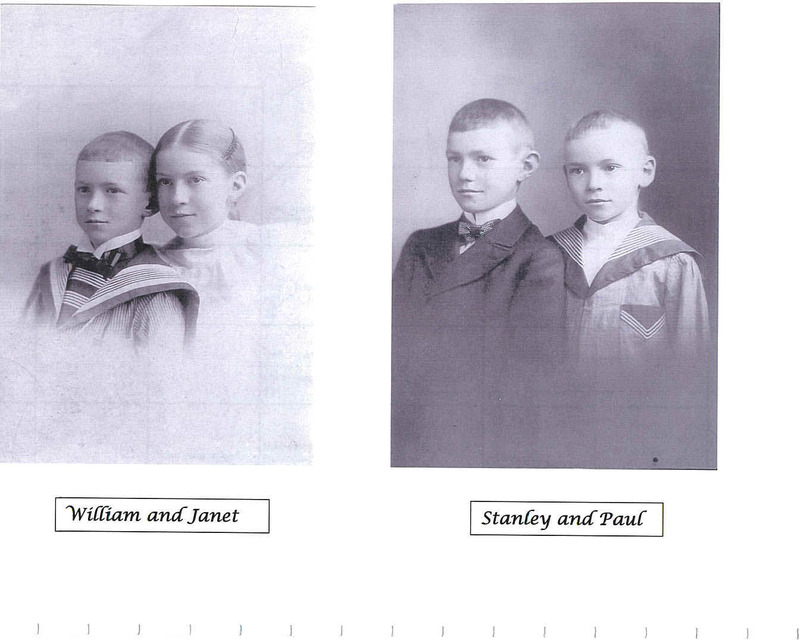 The boys Annie refers to are no doubt her and Robert’s own, Janet’s brothers: Will (b. 1889), who took over the farm when Robert retired and spent much time on his Florida properties; Stanley (b. 1891), specifically to whom she refers in Card #2; and my Grandfather Paul (b.1892). All had chores like watering the sweet corn, tending the chickens, and keeping the yard in good order. Annie suggests that this activity is necessary in case of the worst: “Not knowing what my happen.” In other words, she wants the homestead in good order if she passes, probably because husband Robert has enough to do with farming. Daughter Janet has instructions too: Keep the house, water the sweetpeas and carina, both flowering summer plants, and write every day. Other people mentioned in the postcards are a mystery: Mrs. Brown (Card #1), probably a cousin through her mother (otherwise, why would she call her “Mrs. Brown’? ); Mrs. Robison (Card #2); and Cop Gipy [spell?] (Card #4). What Annie doesn’t say is whether she gets to enjoy the 175-feet of front porch along the main building at the Sanitarium, or if she receives any of the occupational therapy available for women: weaving, basketry, and lace weaving, to name a few. Men had other opportunities. Forms of recreation included croquet, tennis, billiards, cards, and music. It’s doubtful Annie participated, given her physical condition. Concerts and other entertainment were given on special occasions, which surely Annie enjoyed. In conclusion, the Sanitarium closed at the beginning of World War II, mainly because the doctors and nurses were needed in the defense of the country. Annie was admitted around the first of May and planned to finish her treatment by the end of June. We don’t know how successful her therapy was nor how it was paid for. The Gray farm probably couldn’t have provided the amount of income for that length or level of care, nor was Medicaid available in those years. We do know that, according to her death certificate, Great-grandma Annie died of chronic interstitial nephritis, a chronic or acute inflammation of the kidney caused by infection, degeneration, or vascular disease. A contributing factor was that chronic rheumatoid arthritis for which we believe she was treated at the Mercer Sanitarium. Annie was described as an “invalid” at the time of her death, just three days before Christmas in 1922, at the age of 72. But, two things seem certain from reading her postcards: Annie surely had a positive attitude while hospitalized and realized the love and devotion of her family back home. Each correspondence ends with “Love” or “Lovingly.” That must have brought comfort to both the writer and the reader. I know it does to her great-grandson over a century later.